Welcome to your IELTS Reading assessment For us to assess your suitablity to take the IELTS exam and reach the band score you require, we need to have an overall assessment of your English level and your awareness of the exam itself. This part of the assessment will measure your reading ability with a short test. It is not a full test, however, it will provide us with the information we need. Please read the instructions before you begin the test. ( 시험시작 전에 지시사항을 읽어주세요 ). There are 2 short texts of about 400 words each. You will have 25 minutes to read the texts and answer all questions. We have added 5 minutes to the time (20 minutes + 5 minutes reading and checking time). (25분 중 5분은 checking 하는 시간으로 사용해주세요). At the end of the time (use the timer), you must stop, and hit the 'submit' button. Your score will be given to you on the screen, and also an e-mail will be sent to you. 25분의 시간이 끝나면, ( 타이머를 이용하세요) 시험을 마치시고, 제출버튼을 누르세요. (화면으로 점수가 나오며, 이메일로도 점수를 받아 보시게 됩니다). the battery. 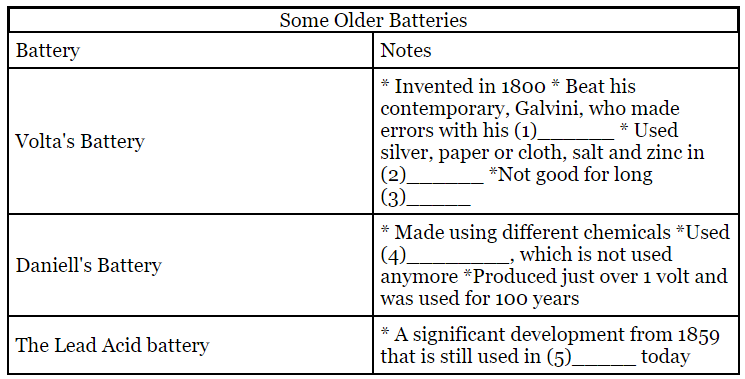 A battery does not actually store electricity. A battery, which is actually an electric cell, is a device that produces electricity from a chemical reaction. The story of the battery is one of people trying to create different compounds to create an electric current. The two goals on improving batteries have always been to create ones that can produce an electric current for a long time and to make them smaller and smaller. Alessandro Volta is credited with creating in 1800 the first battery and the first practical method of generating electricity. Luigi Galvani, another Italian scientist and contemporary of Volta, almost made the discovery, but misinterpreted his research results. Using a frog’s leg in an experiment, Galvani concluded that the electric current was ‘animal electricity’ and did not come from the apparatus he had set up. Volta’s battery was made by piling up layers of silver and paper or cloth, soaked in salt, and zinc. These layers were assembled, without paper or cloth between the zinc and silver, until the current was created. Volta’s battery was not good for delivering currents for any significant duration. This restriction was overcome in the Daniell Cell in 1820. Using different chemicals, John Daniell used a copper pot, copper sulphate, sulphuric acid and mercury to produce his electric current. Although we now know better than to put mercury into batteries, this battery, which produced about 1.1 volts, was used to power telegraphs, telephones, and even to ring doorbells in homes for over 100 years. Although many other chemical combinations were used in batteries over the years, the lead acid battery is one that stands out. First made in 1859, it was further improved in 1881 and this design even now forms the basis of the modern lead acid battery found in cars. were experimenting with creating batteries using lithium, but the breakthrough in the chemistry was achieved by adding the ion into the equation. Not long after its invention, the CIA shared the lithium-ion battery concept with the public and a company working on an exploratory project developed and created the first patent for the lithium-ion battery for commercial use in 1968. Used for a variety of different applications, the first lithium-ion battery was a game-changer in the medical industry, where it is used as the power source in heart pacemakers. Write NO MORE THAN TWO WORDS in the answer boxes below. Fill in boxes 1-5 with the correct words. Write NO MORE THAN TWO WORDS from the text for each answer. 6. The lithium-ion battery was invented as part of the United States' contribution to the . 7. The that allowed the success of the lithium-ion battery was the chemical addition of the ion to the equation. Measured across the continent, Australia receives an average of only 465 mm of rainfall a year, compared with Europe's 640 mm and Asia's 600 mm. High evaporation allows just 12 per cent of its rainfall to run off and reach waterways. Even so, there's enough water for everyone—but it's seldom in the right place at the right time. 500 large (more than 15 m high) dams store a total of 93,957 gigalitres (Sydney Harbour holds about 562 GL). There are also countless smaller dams, called weirs, on most Australian rivers—8000 in the Murray-Darling Basin alone—and more than 2 million farm dams. migration and reproduction, siltation and salinity in deltas are altered. environment itself is a legitimate water consumer, with attendant needs and rights. All this calls for careful study of a river's state and function before it's dammed. Australia's newest megadam straddles a gentle valley on the Burnett River, 260 km north-west of Brisbane. Apart from a soupy stain low on its upstream face, the concrete is spotless and dazzles the eye under the sharp Queensland sun. This is Paradise Dam, completed in 2005. Impressive though it may be, Paradise, like other large dams, is a mix of good points and bad. For some people, the bad prevail. High among the complaints has been that the rationale behind it was political. Then there are the potential environmental impacts downstream, especially around the river's mouth in Hervey Bay, which worry people such as commercial fishers and tourism operators. correct heading for sections B–E from the list of headings below. Write the correct number i–ix below. Choose each heading once only. You have completed the IELTS Reading assessment Your score will be displayed shortly.